Hands up! Who wants to learn to scuba dive? Everyone wants to learn to scuba dive! This post is written on the principle that actually everyone is a scuba diver – it’s just that some of you haven’t learn to scuba dive yet! So here we present the what, and how, and where, and when to start. 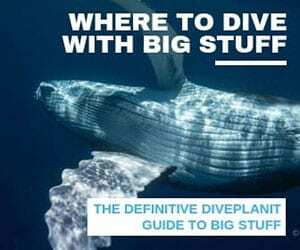 (If you’re wanting someone else to learn to dive, you could share this page with them, or use a more subtle approach). There can be quite a bit of confusion about your first certification. Introductory diving, Discover Scuba Diving (DSD), ‘Try Diving’ and any ‘Resort Dive Program’ might include basic theory, basic skills and an open water dive but they do not lead to a qualification – though they might give you a pretty certificate! 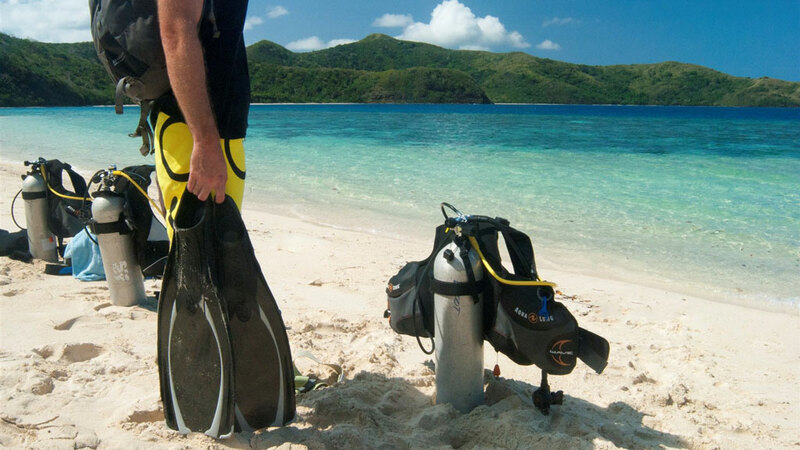 It’s the PADI or SSI (or equivalent) Open Water Certification – that qualifies you to dive to 18m – which you’re after. This is usually a 4 day course (which can be spread over more than four consecutive days) which includes one day of theory – either classroom or eLearning; often one day in confined water – a swimming pool – learning and practising the skills of scuba diving, then the real thing – four dives over two days in the open ocean practising the skills and enjoying the thrill of getting up close and personal with the ocean’s inhabitants in their natural environment. Some dive centres allow you to do the theory by eLearning (usually at home), so then it becomes a 3 day course, others allow you to tag on more dives at the end making it a 5 or 6 day course & dive holiday. The only prerequisite is a medical questionnaire. Ask the Dive Centre to send you one and check you can tick all the boxes. Asthma or heart problems might exclude you, and other conditions might require a short Dive Medical with a GP. How do you want to Learn to Scuba Dive? It might seem a funny question – but everyone learns in different ways. Some can read the manual and be an instant expert (supposedly). Others need to see how it’s done. And for many it’s actually doing it that develops the capability. Learning a new skill should be great fun – so if you’re not having fun something is wrong. People learn most easily when they feel comfortable – and not stressed. So choose a place where you will feel most at ease. If you feel most relaxed on holiday, learn to dive within your holiday – they you don’t have any of the other pressures of a hectic working week. 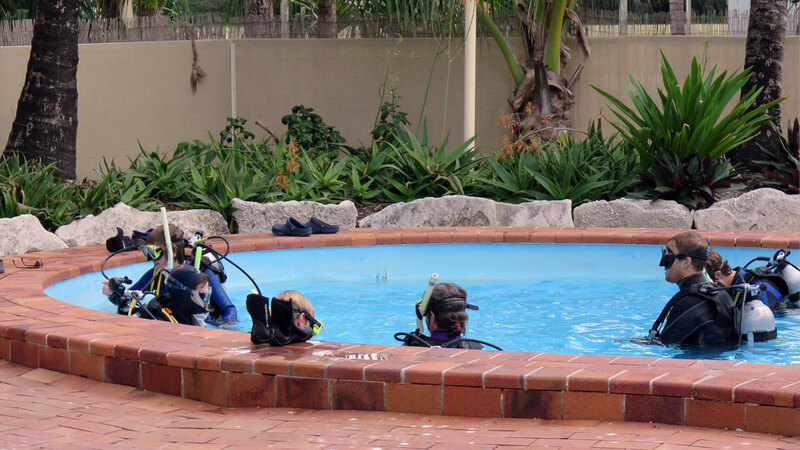 If you’re most relaxed at home: learn with your local dive centre over consecutive weekends. If you don’t like the thought of cold water, wetsuits and weights – which can make learning harder, learn in warm waters. If you don’t like the idea of low visibility, make sure you find somewhere with crystal clear water. If you always like to be able to see the bottom, make sure your first dive is off a shallow shelving beach. If you are potentially a nervous learner – go and meet your potential dive instructor before you sign up. Ask all the dumb questions so that you will feel confident once the course starts. Learning to dive with someone you know also helps and can be less intimidating that learning with a bunch of complete strangers. Conversely, a great way to meet a new bunch of people who probably share the same values as you is to learn to dive. At this stage, don’t get too hung up or whether it’s PADI or SSI or any other particular certification agency. In terms of ‘should I learn to dive then go on a diving holiday’ or ‘should I go on holiday and learn to dive?’ here are the pros and cons of each. Pro: if it is a dive holiday with a bunch of existing divers – probably the best way to go. Don’t want to have to listen to everyone’s big diving stories while you’re stuck in the classroom/pool. Con: some people’s lives are too hectic to give away consecutive weekends, and possibly some evenings to study, especially if there is no dive centre on your doorstep. Pro: the perfect combination of warm, clear, calm water is more likely to be found in some tropical location; and in many places – you do your ‘confined water’ skills and drills in the ocean. Pro: bundle and save! Some places offer discounted accommodation if you stay and learn to dive with them. Con: “I’m wasting valuable holidaying time!” – if you feel like this, definitely learn before you go. Fiji’s Yasawa Islands, relatively close and inexpensive, though most places in Fiji offer courses. Another great backpacking option is the Gili Islands, not far from Bali; some Dive Centres will even give you free accommodation if you take a dive course with them. North Sulawesi has a number of resorts that offer training, and as it’s a year round destination, you can start planning it now! Tioman Island in Malaysia offers very reasonably priced learn to dive courses. Via Singapore or Kuala Lumpur – it’s surprisingly easy to get to too. 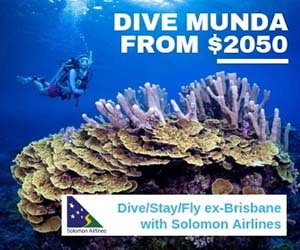 The Solomons too is not far away and has warm and clear waters in both Gizo and Munda. The Cook Islands offers lots of other outdoor activities in addition to snorkelling and diving. Another funny question. As soon as possible of course! 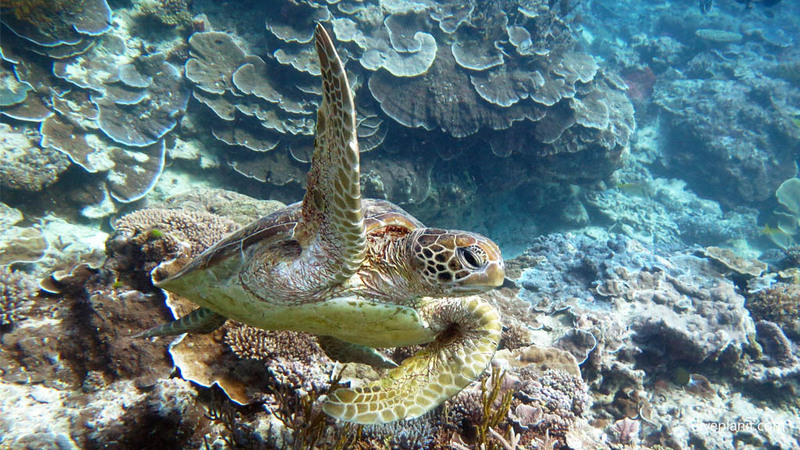 Kids as young as 10 years old can learn to dive overseas, though in Australia the minimum age is 12. Like learning to swim, there’s no maximum age either, but like swimming, the younger you are when you start, the more confident you’ll be in the water. 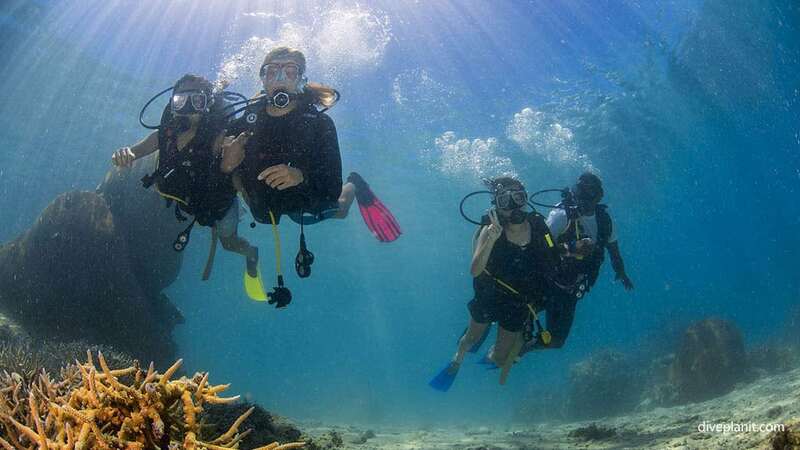 Diving as a family can also be a great way to stay connected. Families wouldn’t think twice about a skiing holiday – the same applies to a diving holiday. It terms of ‘when is the best season’ to learn to dive? In Australia, the water is usually clear enough year round, and most dive centres would have a nice sheltered spot for your first open water dive. Overseas, many places have their Better Season – when the conditions are ideal in terms of warmer, calmer, clearer waters. Still need a reason to Learn to Scuba Dive? Learning a new skill is actually great fun. Remember when you learned to ride a bike and the training wheels finally came off? The freedom – that boost of self-confidence! Challenge yourself in a new environment and gain a qualification recognised the world over. Learn. To. Dive. Click here to find your local dive centre.